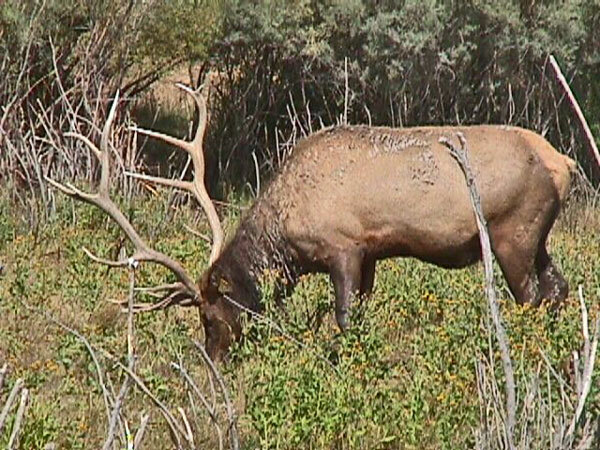 Rocky Mountain Elk inhabit the Rocky Mountains from central British Columbia down into New Mexico. 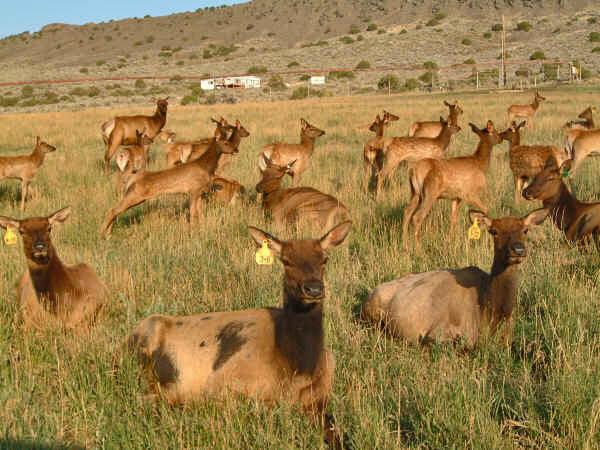 There are scattered populations of transplanted animals in many other states. 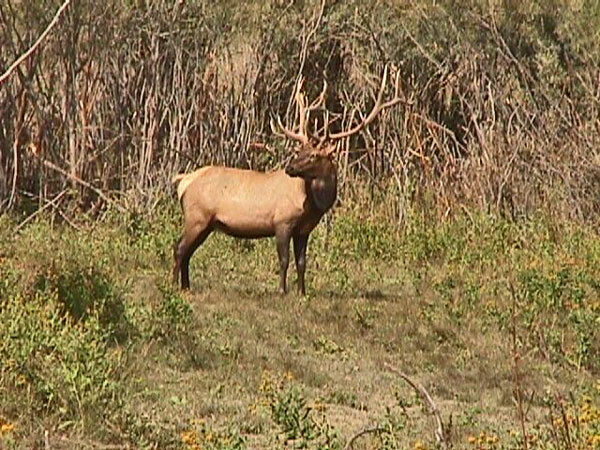 The current North American elk population is about 800,000. 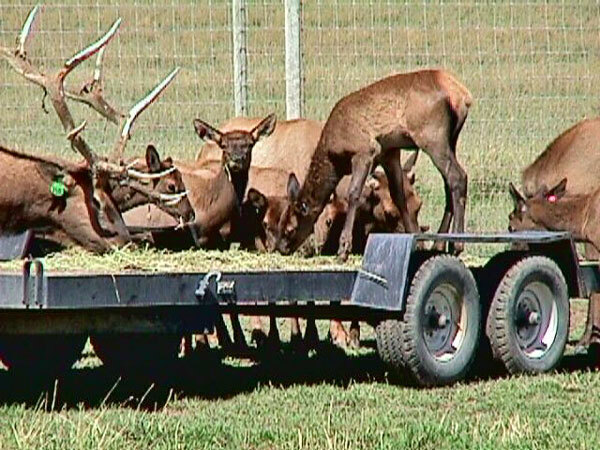 Rocky Mountain elk bulls weigh 700-800 lb (300-370 kg) and cows 450-550 lb (200-250 kg). Bulls may stand five feet at the shoulder. 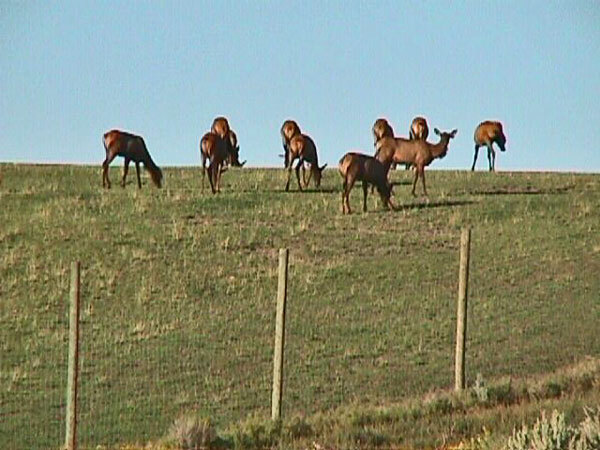 Their coloration is generally tan with dark brown legs, neck, head and belly, with a buff colored rump. Bulls may be lighter colored than cows, appearing silver at times. White and silver colored animals do not appear in the wild. 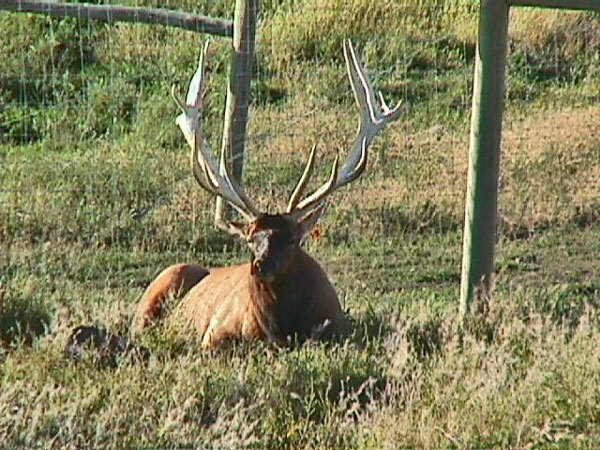 Antlers of mature bulls usually have six or more points per side with main beam lengths of 5 ft (1.5 m). 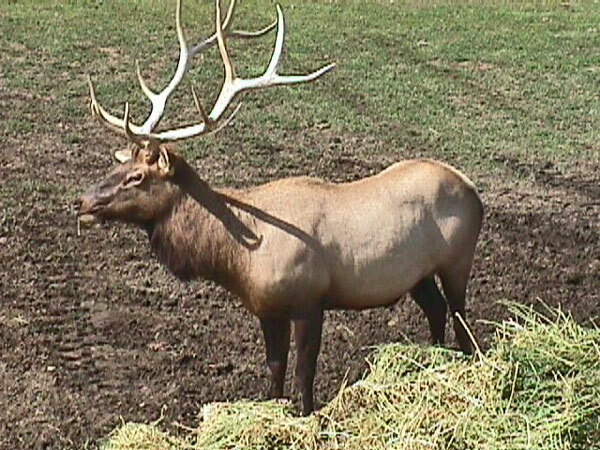 Elk live up to 18 years but the average is between 7 and 10. 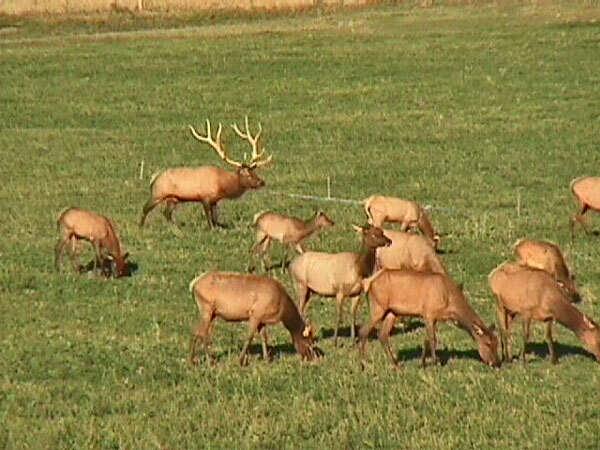 The Breeding season (rut) for elk starts in August and goes through October. 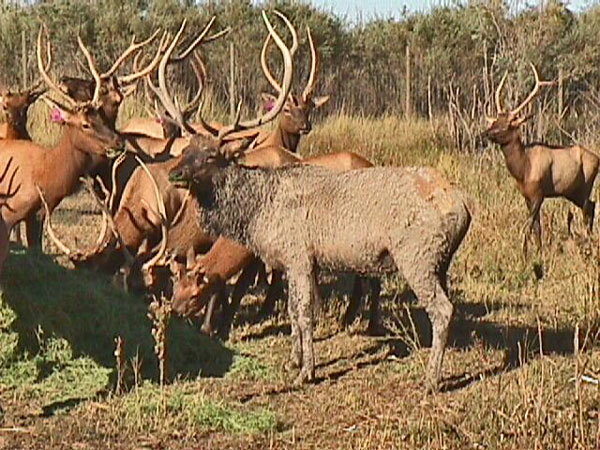 At the start of the rut, a mature bull elk will gather a harem of cows to breed with. He and other bulls will fight for the leadership of the harem and over cows so that they can make their harem bigger. 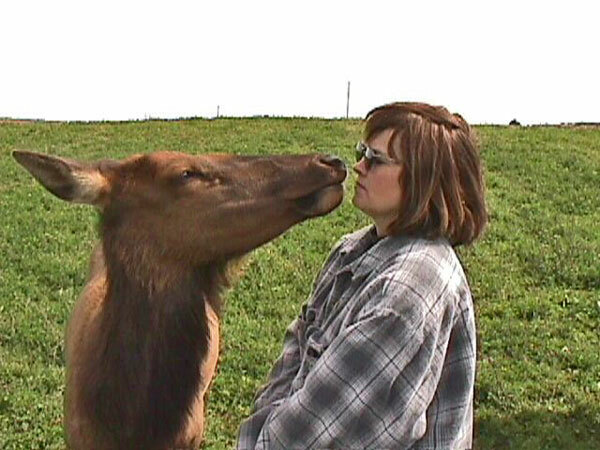 An experienced bull may gather a harem of 60 cows. 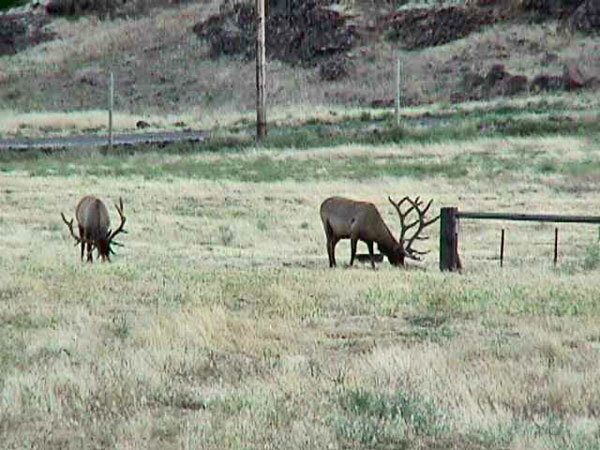 Sometimes a bull will let a younger bull join his herd as they move down into the valley and lower land for the winter. The gestation period for a cow is around 8 months. The cows give birth to one or two calves in May or June and the newborn calves weigh about 30 pounds. 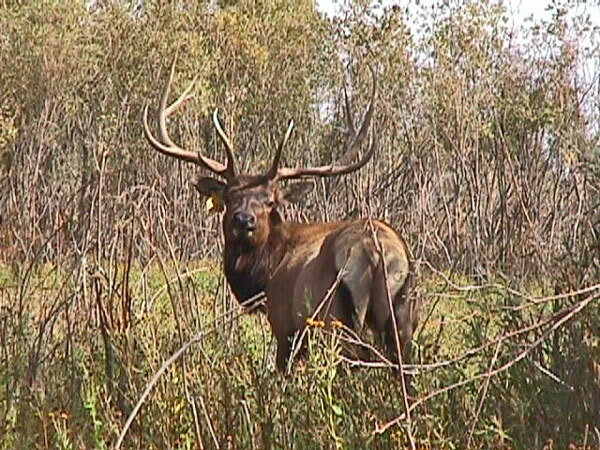 The time of the rut is also when the bull will lose the velvet on his antlers. This will fall off or is helped when the bull attacks a tree because he wants to fight. 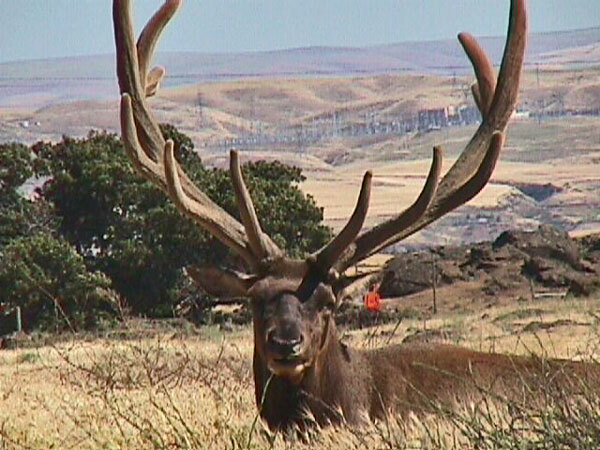 The bull usually loses his antlers in the spring, and then starts to re-grow them during the summer. 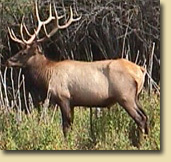 In the summer, the elk usually graze and live in the forest and deep brush of the high mountains. 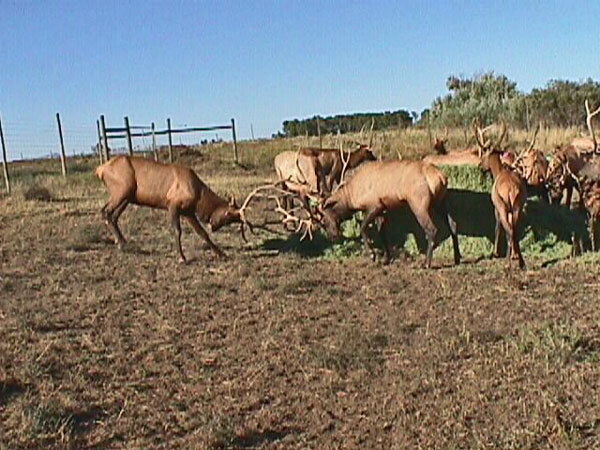 Elk generally feed an hour before to an hour after sunset and the same at sunrise. 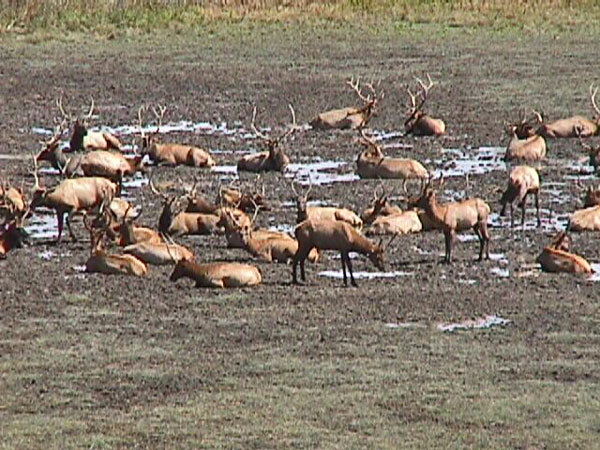 The rest of the day, they mainly stay bedded down in heavy cover and sometimes will move around and graze a little bit in the middle of day if they feel safe. In the fall and winter, they migrate to the lower valleys and wooded slopes, and eat dried grass and shrubs. 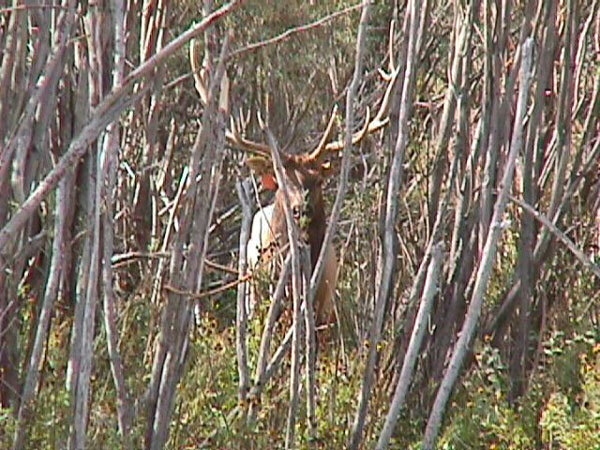 They also eat berries and the bark off small trees. 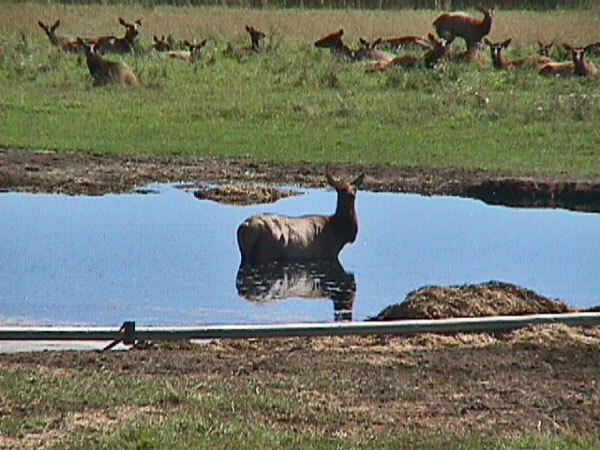 In the spring, elk begin to migrate back up to the higher lands and rest up from the rut. 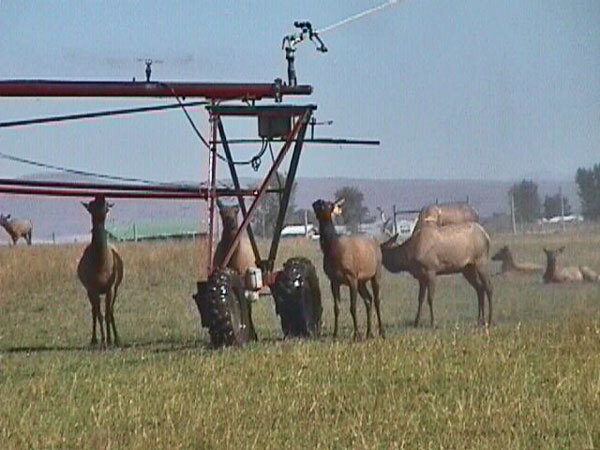 During this time, they eat the fresh grass, chew on young trees, and get very fat and the end of the summer. 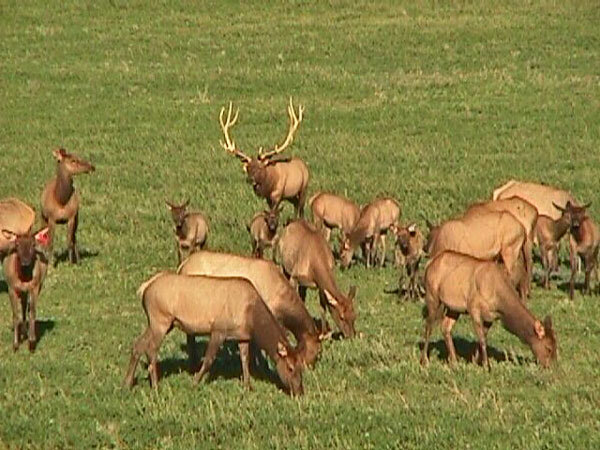 The primary predators of adult elk in North America are wolves, grizzlies, and mountain lions. Coyotes and American black bears sometimes prey on the calves. 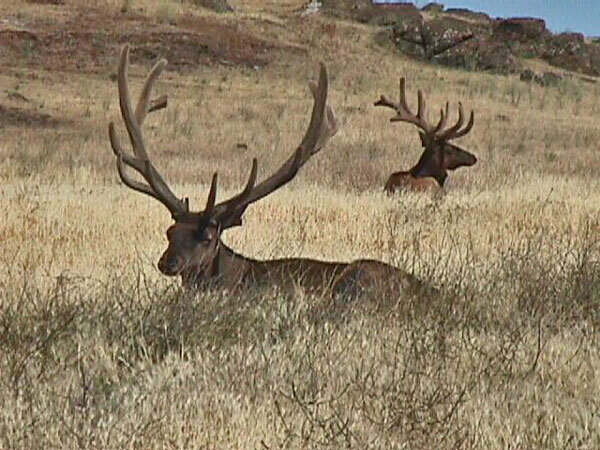 Occasionally a fight with another bull will lead to severe antler-inflicted open wounds or internal trauma and death. 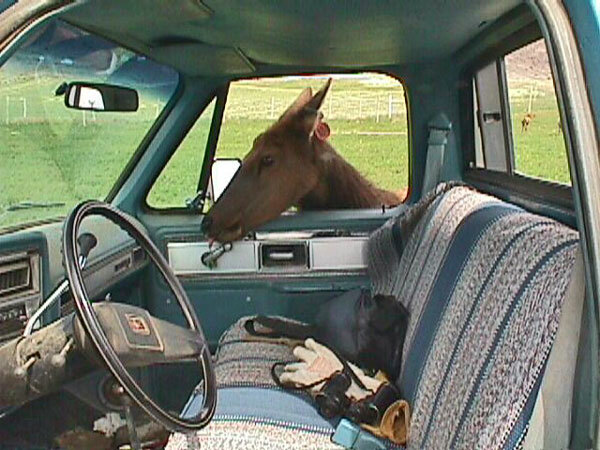 Roosevelt Elk inhabit redwood forests north of San Francisco Bay in Northern California, to Fraser Valley of southwestern British Columbia. Transplants have been made to Afognak Island in Alaska and are currently being made to portions of mainland British Columbia's Coastal Mountains north of Vancouver. 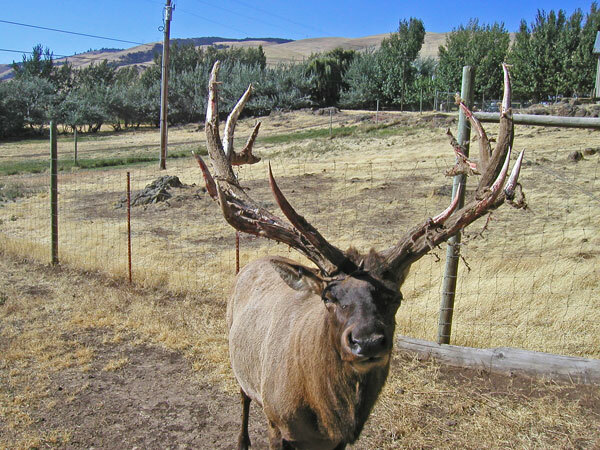 Roosevelt Elk are larger and darker than Rocky Mountain elk and the may weigh in excess of 1000 pounds. Estimates of the total population range from 20,000 to 30,000. 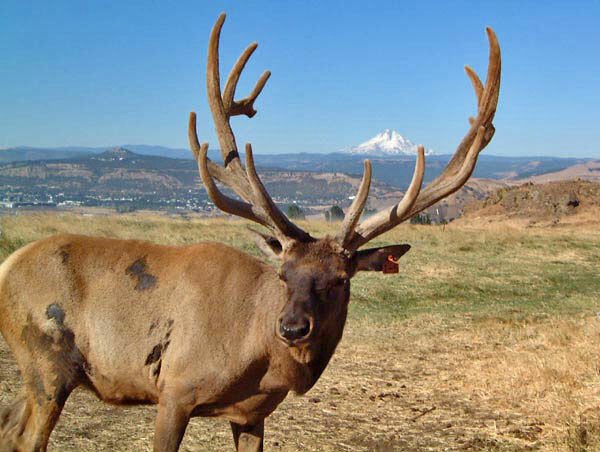 The largest population of Roosevelt elk is found in the Olympic National Park, but large numbers of elk can also be found in Mount St. Helens National Volcanic Monument and Redwood National Park. 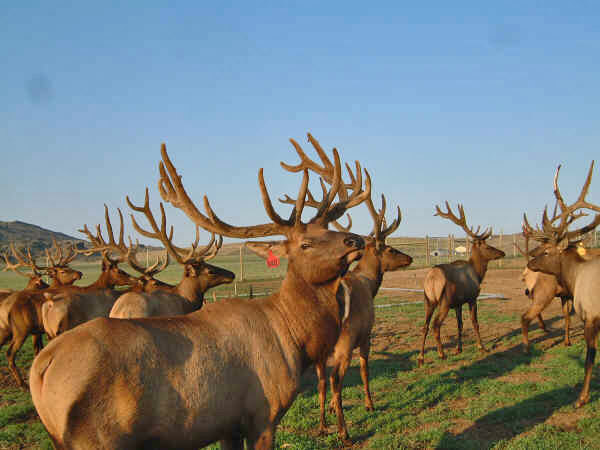 Clinton Hart Merriam who first identified the elk in 1898 named the species after Theodore Roosevelt.